The Nyingma Institute, founded in 1972 by Head Lama Tarthang Tulku Rinpoche, serves as a gateway to the Mandala of Nyingma organizations established by Rinpoche. Our mission is to share the healing wisdom of the Nyingma tradition and reveal a path of inner freedom. 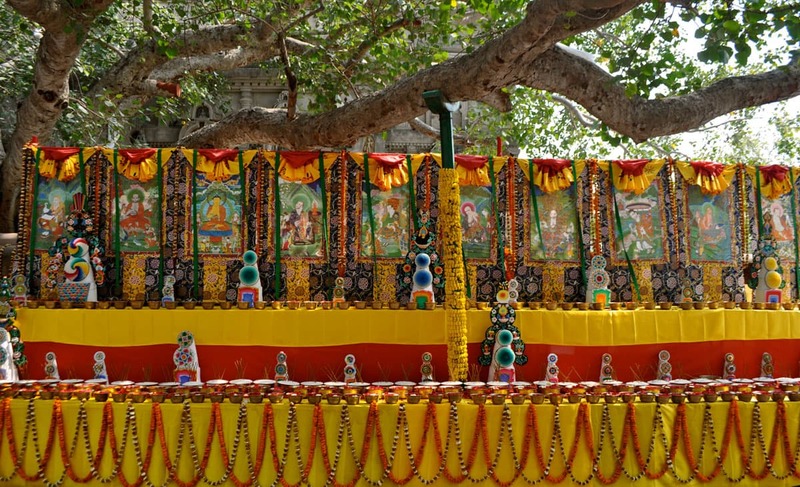 Offerings at the Mahabodhi Temple in Bodh Gaya, India, site of the Buddha’s enlightenment. We are part of a network of organizations, the Nyingma Mandala, formed to preserve and transmit Tibet’s ancient heritage. A traditional mandala is a symmetrical, intricately detailed artistic representation of the entire universe, or a pure Buddha realm, that can be used as a support by practitioners. It is also an organizing principle that can inspire or guide action, with different qualities associated with each cardinal direction. On a deeper level, it points to the balanced, intrinsic wholeness of being. Each mandala is complete unto itself, and unfolds its meaning in infinite dimensions. Our organizations, which play different but mutually supporting roles, can be understood according to the principles of a mandala. The Tibetan Nyingma Meditation Center, established by Rinpoche when he arrived in Berkeley in 1969, is the spiritual center for the mandala. In the east, Dharma Publishing makes the teachings available through English-language publications and art reproductions. In the south, the Tibetan Aid Project supports the preservation of the Tibetan tradition, the Buddhist heritage, and the Nyingma school. In the west, Odiyan Country Center and a growing range of art projects manifest the beauty of the Dharma as a living force for transformation. In the north, the Nyingma Institute makes the teachings more widely available. Over the years, the vision for the mandala has expanded. Today we carry out our mission through some 25 different organizations and long-term projects on four continents, each contributing to the whole, each working to manifest the teachings in the world. The record of our efforts is tangible and real: supporting the free distribution of over 5 million sacred texts, establishing of our Odiyan Retreat Center, a permanent home for in-depth study and practice of the Dharma, and countless other large-scale cultural preservation projects. Our students learn to provide meaningful service to the Dharma and sentient beings in an immediate and effective way.